I am hosting a special luxury dinner on May 6 aboard the Belmond British Pullman. So if you fancy coming along, visit belmond.com for ticket prices and booking details. For now, Buona Pasqua (happy Easter) and arrivederci. Place the lamb cutlets on a tray. Rub the olive oil over the cutlets and then sprinkle with the rosemary. Put the quinoa into a saucepan with 250ml water and bring to the boil. Cover with the lid, then reduce the heat to low and simmer for 10 minutes. Remove the pan from the heat and set aside, with the lid still on, and allow the grains to gently steam for 4-5 minutes. Meanwhile, heat the extra virgin olive oil in a non-stick frying pan over a medium heat. Add the chilli and garlic and cook for 1 minute before adding the courgette. Sauté for 8-10 minutes, or until the courgette begins to soften and turns golden brown. Remove from the heat. Transfer the cooked quinoa to a salad bowl and add the courgette, lemon juice, mint, spring onions and tomatoes. Season generously with sea salt and freshly ground black pepper and stir to combine. Preheat a barbecue grill or a chargrill pan to medium-high. Cook the cutlets for 2-3 minutes on each side, or until cooked to your liking. Transfer to a warm serving plate and season with sea salt. Cover with foil and rest for a few minutes. Serve the lamb cutlets with the courgette and quinoa salad. Put the cranberry juice in a saucepan with the cinnamon stick and sugar. Slice a few strips of rind from the orange and add them to the pan. Then juice the orange and add the juice. Bring to the boil, stirring, to dissolve the sugar then remove from the heat. Put 125ml of cold water in a bowl and sprinkle the gelatine over. Strain the cranberry juice into a jug, ensuring you have 600ml of liquid. Stir the softened gelatine into the warm liquid. Continue to stir for 1 minute or until the gelatine has completely dissolved, then pour the jelly into six dessert glasses and refrigerate overnight. The following day, make the mascarpone cream. With a whisk, beat the egg white in a bowl until soft peaks form. Add the sugar and continue to whisk until the egg white is firm and glossy. In a separate bowl, stir together the egg yolk, mascarpone, Tia Maria and Marsala. Fold half the egg white into the mascarpone mixture until it is well combined, then gently fold through the remaining half. Spoon the mascarpone cream over the jelly and place in the fridge until ready to serve. Top with fresh raspberries. 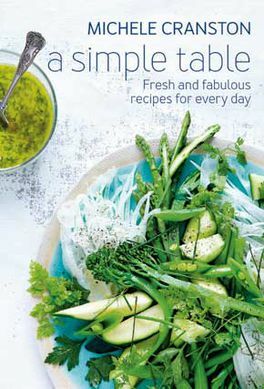 Recipes taken from A Simple Table by Michele Cranston (£14.99, Murdoch Books), photographs by Petrina Tinslay. To order your copy, call the Express Bookshop on 01872 562310, send a cheque or postal order made payable to The Express Bookshop, to Express Bookshop, PO Box 200, Falmouth, Cornwall TR11 4WJ, or order at expressbookshop.com.